1 Publications by "D. Li"
We propose a novel image interpolation method for resolution enhancement of still images. The approach consists of a nonlinear mapping from pixel index space to color space based on the low-resolution image so that non-integral pixel indices in a super-sampling can be mapped to colors, i.e.. interpolated. This nonlinear mapping is based on an extensor transformation of 2D pixel indices to an N-dimensional vector space that encodes the Euclidean proximity interrelationships among a neighborhood of N pixels. Experimental results indicate that extensor-based interpolation yields results that are qualitatively superior to classical bilinear and hicubic interpolation, that has important advantages in comparison to edge-directed and optimal-recovery interpolation methods, and that has comparable or lower computational cost. K. Palaniappan, J. Uhlmann, and D. Li. Extensor based image interpolation. IEEE Int. Conf. 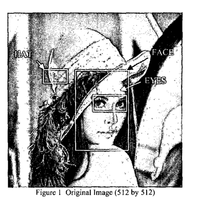 Image Processing, volume 2, pages 945--948, 2003.